As always, we are thankful for your continued support. Thank you for partnering with us as we train and equip the next generation of Christian leaders. Please keep our students in your prayers as they continue to dig into the scriptures and textbooks this semester, especially as they face assignment deadlines in this busy season - all while working out how to apply their learning in their respective ministry contexts. Pray too for our faculty who are preparing to lead courses next Semester. As we approach our fourth module, we want to remind you that our courses are designed to be versatile in their application, as our goal is that they would be useful in equipping those working in all ministry contexts. Whether you serve in a volunteer capacity, are in full-time ministry (inside or outside the walls of the church) or are discerning where God is calling you, we strongly believe that ministry formation is a vital and beneficial tool. Our courses are available for credit or audit, in both a full-time or part-time capacity. Each course centres around a 2-day block of intensive, on-site classroom learning. Class sizes are maintained at a small size to facilitate inclusive conversation and relationship-building. It has been said that "a leader who is not a learner, probably isn't leading well." 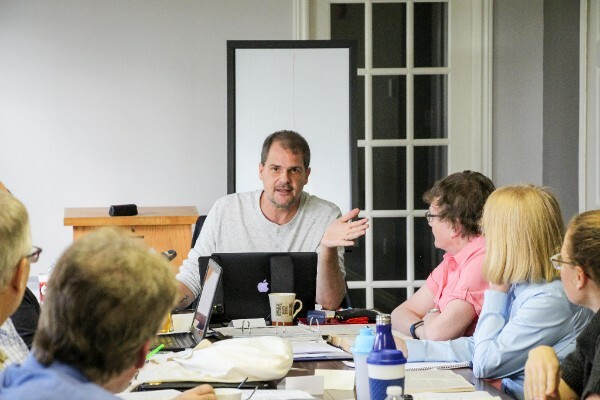 If you're seeking to strengthen your knowledge and understanding of God, while being challenged and equipped to share your faith with those in your community, we'd love to chat with you about training at TSoM. The Spring 2018 semester is fast approaching! If you're considering ministry training, we'd love to hear from you and help you explore if TSoM is the right fit for you! Visit our website or call us at 506.642.2210. Overview: This course is a guided exploration of Jesus’ embodiment and teaching of the Kingdom of God and practices by which Jesus’ actions and teachings might be emulated and obeyed in our postmodern contexts. This course will help you (1) articulate a holistic understanding of the Kingdom of God as learned from Jesus’ actions and teaching; (2) delineate various practices that faithfully embody and/or manifest the reign of God in their current contexts; and (3) design, implement, and assess a learning lab that seeks to draw practitioners into the life commended by Jesus. Overview: This course will introduce Paul’s writings in their probable historical sequence. Beginning with Galatians as the first of his letters, the student will then proceed to 1 & 2 Thessalonians, Philippians, 1 & 2 Corinthians, Ephesians, Colossians, Romans, 1 & 2 Timothy, Titus and Philemon. Special attention will be paid to Paul’s understanding of the Biblical narrative and its application within culture. Overview: Broken in two, these pastoral care courses explore the theology and practice of working with others. It enables students to explore the themes of ‘otherness’ and ‘diversity’ within the mission context. The student will develop their own interpersonal skills using theoretical models drawn from theology, sociology and psychology, and how they relate to people in a range of situations. Overview: This course engages students in theological reflection on teamwork. The students use theological resources to evaluate, apply and develop key skills in facilitating effective teamwork in the mission context.